Police have issued a warrant for the arrest of a man suspected in the shooting death of a Memphis police officer, authorities said. At a Sunday evening press conference, Memphis Police Director Toney Armstrong announced that police were searching for Tremaine Wilbourne, 29, in connection with the killing of Ofc. Sean Bolton, who was fatally wounded during a traffic stop Saturday night. According to police, Bolton saw a vehicle that was illegally parked when he pulled in front of it and illuminated it with his spotlight. When he approached the vehicle, he was confronted by the passenger and a brief struggle ensued between the two of them. The passenger drew a weapon and shot Bolton, multiple times, police said. Police said a civilian had used Bolton's radio to notify police about the shooting. Ofc. 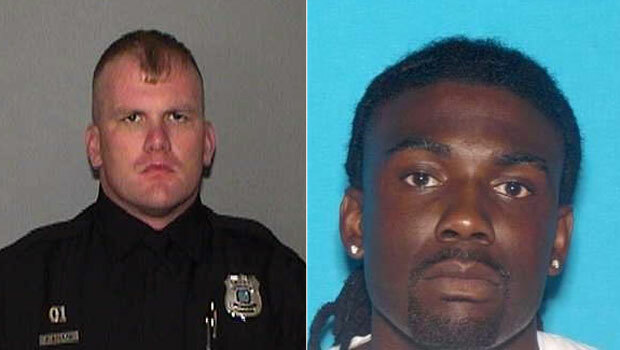 Sean Bolton (l) was killed in a routine stop in Memphis, Saturday night. Police are searching for Tremaine Wilbourne in connection with the killing. CBS News / Memphis P.D. The passenger and the driver of the vehicle fled the scene before more officers could arrive. Police found drug paraphernalia and about 1.7 grams of marijuana was found in the vehicle. Armstrong said Bolton had apparently interrupted a drug transaction. "When you look at this individual, you're looking at a coward," said Armstrong. "You gun down a police officer for less than 2 grams of marijuana." Armstrong said the amount of marijuana found would have only gotten a misdemeanor citation and a fine. The driver later turned himself into police and was released without charge. Memphis Police are working with the U.S. Marshals Service, which is offering a $10,000 reward for information leading to the arrest of Wilbourne. Wilbourne is still at large, police said and considered to be armed and dangerous. Wilbourne had been out on supervised release after being convicted of a bank robbery, according to CBS News affiliate WREG. Bolton had been a member of the department since 2010. He was also a Marine veteran who served in Iraq. He is the third Memphis officer to be fatally shot in slightly more than four years. Officer Tim Warren was killed while responding to a shooting at a downtown Memphis hotel in July 2011. In December 2012, Officer Martoiya Lang was killed while serving a warrant. "The men and women in blue have certain rules of engagement that they have to follow, but at any given minute in a 24-hour day they're dealing with folks who have no rules of engagement."